Home / Columnists/ Plastics ban is good in parts; room for corrections? On Tuesday Cabinet approved a proposal by the President as Minister for Environment on short-term, mid-term and long-term measures to curtail the use of polythene or the soft form of plastics familiar to the average citizen as shopping bags and lunch sheets, and polystyrenes and other plastics. It is a detailed proposal that prohibits plastics for decoration in all events (yes, it includes plastic night gowns on Vesak lanterns), but allows for the use of plastics thicker than 20 micron where a 20 micron polythene is a pretty thin one about one-fifth the size of a human hair. Lunch sheets are prohibited, period. The order also prohibits the use of polystyrene plates, cups and spoons and sale of processed or cooked foods in polythene containers. Open burning of plastics is also banned. What bothers me about the order is the ban on cooked meals packed in polythene containers or lunch sheets, but the absence of regulation to curtail the use of shopping bags. The midterm and long-term proposals are puzzling but more on that later. Even if the Government is to go ahead with the ban, it should do so with the humility that neither the proposer Government nor the sceptical outsiders have the perfect answer. Therefore a thorough follow-up of the implementation and an evaluation of impact are absolutely necessary. Effect on micro-entrepreneurs and the emergence of substitutes or lack thereof need to be monitored and assessed, and policy corrections made. In this column I try to lay out the issues of concern, hoping for changes to the ban if at all possible or a better implementation process as second best. The number one villain in the solid waste crisis in Sri Lanka is now correctly understood to be our food waste. It is good to see our municipalities finally beginning to manage their solid waste collection by collecting food waste separately. By all accounts people are responding positively. Now we come to the second serious problem – i.e. plastics in our waste in the form soft sheets or in hard form, the former of which is the immediate concern. The lightness, impermeability and strength of the plastic bags and lunch sheets make them wonder materials but those properties are their weaknesses too. These plastics easily ‘leak’ into the environment, get carried by air and water to end up in the oceans to last forever harming the ocean ecosystem and the shores in the process. Today plastic pollution of oceans is a massive global problem. We have to curtail the use of plastics and dispose what we use safely, but how is the question. Plastic grocery bags cost little to make but hold more than a thousand times their weight. They’re light. They’re waterproof. Piece of fish wrapped in paper drips all over. Wrapped in plastic you carry it home in peace. The lunch sheet is the other plastic ubiquitous in all parts of the country at business settings or social events. The lady who is selling rice and curry lunch packets by the roadside sitting under an umbrella could be a widow struggling to feed a family. All she needs right now are supplies for one meal, few lunch sheets, used new papers and she is in the lunch packet business. A worker leaving home for the city at three or four in the morning is the customer for her lunch packet business. Both are beneficiaries of the plastic sheet. In fact, plastic wrapping is really a poor man’s wrapping and if we take it away, it could affect many people unseen in our middle class enclaves. There are many bad uses of plastics. Use of plastics for decoration religious, political or social events can be banned because the extra cost of decorations here can be averted without economic costs. These are also uses that can be policed. On the other hand the take-out hoppers or the dosa serving may cost you less than a hundred rupees, but it comes with five to six different plastic sheets or tiny bags. Even in the remotest village with plenty of water, plates are always covered with a plastic sheet to save washing. A lunch sheet ban takes care of these but affects uses with economic implications for the working poor. There is much talk about biodegradable plastics, but we are yet to see the viability of these on a large-scale. A fork made from a potato-based polymer, which I brought home from a takeout in a posh suburb in the US, came unscathed after months in my compost bin in Sri Lanka. In addition to the question of degradability in real life situations, biodegradable plastics won’t solve the littering problem. Paper is biodegradable in the long term, but does not cut it for packaging. In the US, shoppers may hug their thick paper bags on their way to their cars, but paper bags are not viable for those who travel in congested public transport here. Cloth bags too do not cut it when handling wet or moist materials. In the Parliament, there was a fuss about replacing plastic bottles with glass bottles, but that is not advisable for Parliament or for public events. Glass is thousand time heavier than the plastic equivalent and breakable too. We don’t want our excitable Parliamentarian doing harm to each other with broken bottles, or trucks carting water bottles across town at great energy and environmental costs. Paper or plastic alternatives are clearly more expensive. Although the jury is still out there, paper or glass alternatives can leave a larger carbon footprint too because of heavy economic and environmental costs in production and transport. Several cities in California have banned shopping bags and France recently joined the fray. Sweden in contrast apparently is opting to further increase the price for plastic use. Taiwan introduced thickness requirements but now has changed to price regulation as follows as they test the water and proceed. In 2002 when the Government of Bangladesh was the first country is Asia to ban polythene bags of less than 55 micron thickness, it was hailed as a major step but plastic use is apparently creeping in. In Sri Lanka, shopping bags are given free, and lunch sheets are so cheap. Therefore, they are used and thrown with abandon. What if we stop giving shopping bags for free and make lunch sheets more expensive? Sounds like a solution that addresses the root cause, but the Government has decided to ban all lunch sheets and do nothing about shopping bags. CEA’s permission can be sought for special uses, but that is an opening for undue use of discretion. 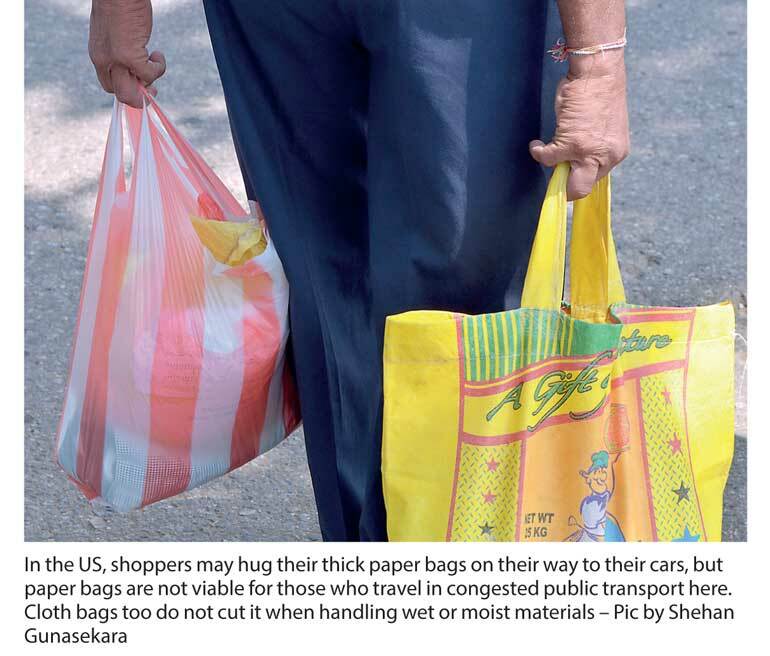 Court ban on charge for shopping bags? The measure by supermarkets reduced plastic bag use by 50% or more in two weeks, but activists acted myopically and Supreme Court headed Sarath Nanda Silva responded myopically. Whether it is possible to reverse this decision by changing the Consumer Affairs Act is something policymakers should explore. The monies charged by supermarkets can be credited to an environmental fund allowing the vendors to keep a portion for administrative costs and payback for reused bags. Shoppers can be credited for reusing bags, even those used in fruit and vegetable counters. When I take used bags to the weighing counter, it takes some convincing to have the staff put a new sticker over an old one. What I want is better. I want my grocery store give me 50 cents or even 10 cents back for each such bag I reuse and more for larger and thicker bags. Our CMC talks about these but we are yet to see one implemented. LIRNEasia’s nascent movement called ‘Campaign for Sustainable Solid Waste Disposal’ and its ‘Colombo Our City’ arm will be pursuing the matter. Supermarkets can be convenient locations. In a 2009 Gazette 1627/19, the Ministry of Environment has issued a gazette prohibiting the “dumping of solid waste at any place other than places designated for such purpose by the relevant local authority or any person or body of persons authorised by them in that behalf”. We could use a gazette specifying hefty fines and mandating action by the environmental police divisions.